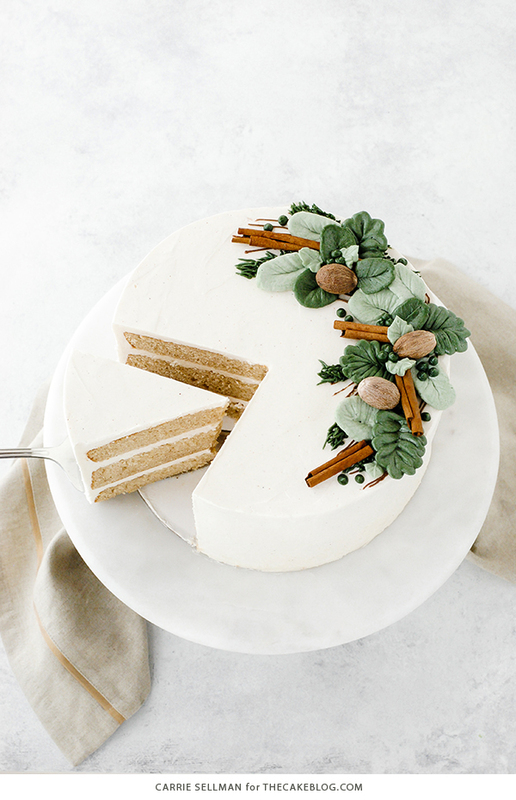 Eggnog Cake – a rich eggnog cake with hints of cinnamon and nutmeg, paired with a creamy eggnog buttercream. 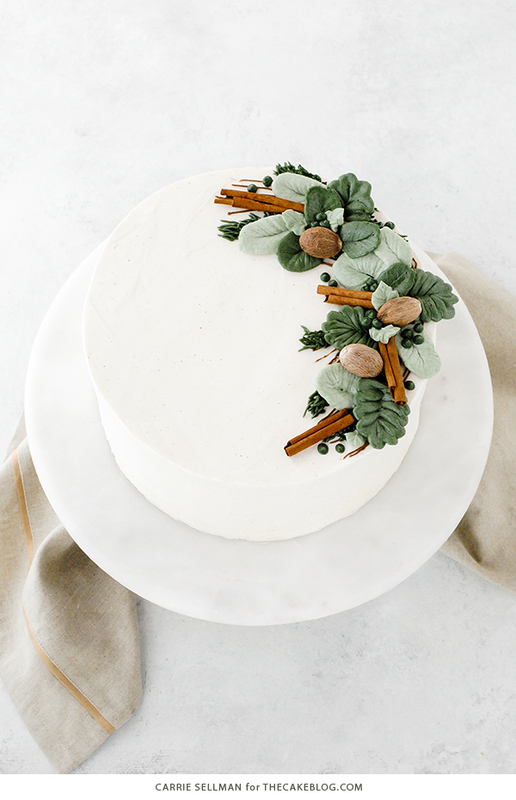 A new holiday cake recipe, sponsored by Promised Land Dairy for their #FarFromOrdinaryMilk campaign. I realize it’s only November but the weather is finally cooling down and my sweaters and tall boots are officially back in the wardrobe rotation. The chilly nights and frosty mornings only confirm that the holiday season will soon be upon us. And I could not help but to jump right in, totally ready for holiday baking! Who’s with me? We all have those favorite holiday recipes that we hold dear, year after year. They go hand in hand with the spirit of the holidays and are the most delicious way to spread some cheer. 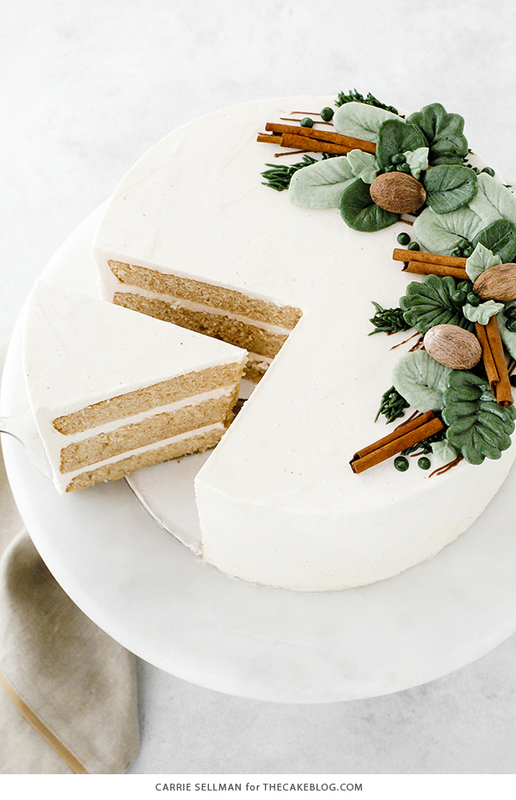 If you’re like me and eggnog is one of your favorite holiday indulgences, then this cake is meant for you! 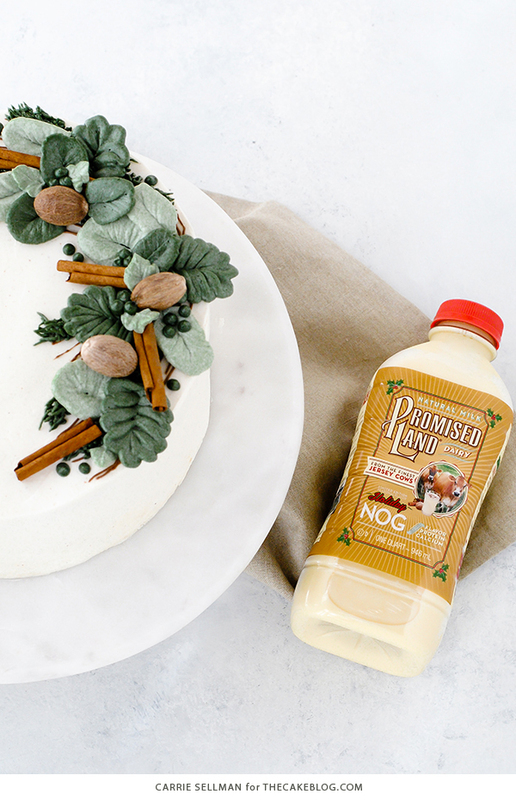 We’re elevating this recipe to new eggnog heights with the help of Promised Land Dairy’s Holiday Nog. It’s the ultimate when it comes to think, dreamy nog with the perfect hint of spice. Because Promised Land Dairy has been producing sustainable milk the same way for 30 years with a small herd of Jersey cows, their milk is uniquely special with its ultra creamy texture and melted milkshake taste. Plus its naturally higher in protein and calcium than ordinary milk, which is a double win in my book. A high quality milk that’s delicious AND adds wholesome goodness to all of our holiday recipes. Now that’s what I’m talking about! Cookies, bars, pies and cheesecake all benefit from a splash of Holiday Nog. Straight up pour yourself a glass of this exceptional milk and you’ll bennefit too! Of course today’s cake is benefitting as well. A basic butter cake gets a splendid update with cinnamon, nutmeg, brown sugar and a hefty cup of Holiday Nog. It’s moist, delicious and will definitely have you feeling festive. But what I loved most about this cake was the eggnog buttercream! The Holiday Nog really amps up a traditional Swiss meringue buttercream in all the right ways. Smooth, creamy and tastes like a winter wonderland. And since the holiday season is no time to mess around with ordinary, I decided to go big with the decorations on this cake. Your response to the buttercream flowers on my Pumpkin Spice Cake inspired me to do something similar with this cake, only tweaked for the winter holidays. I love the look of fresh greenery mixed with wood toned neutrals, so I went for lots of mossy green leaves, much like silver dollar eucalyptus, mixed with broken cinnamon sticks and whole nutmeg. The end result looks like the holidays, smells like the holidays and tastes like holiday cheer! And this time I’m hooking you up with a video tutorial! Hooray for holiday baking! You can find the full decorating tutorial RIGHT HERE. 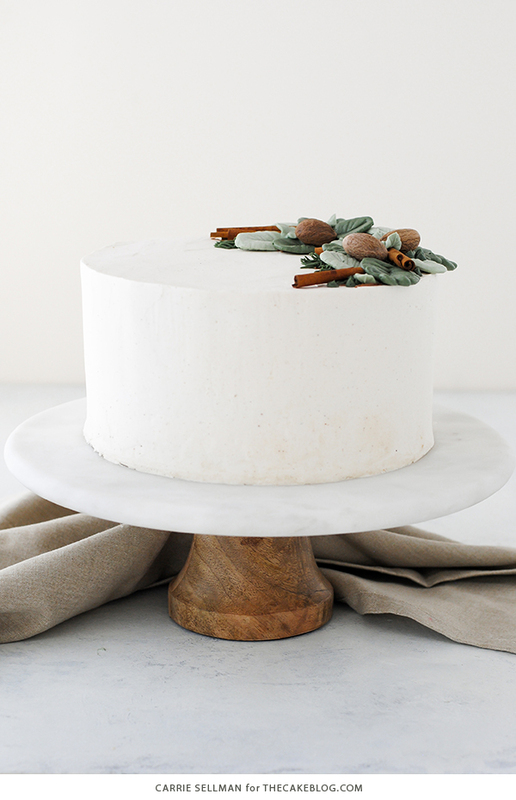 A rich eggnog layer cake with hints of cinnamon and nutmeg, paired with a creamy eggnog buttercream. In large bowl whisk together the flour, baking powder, salt, cinnamon and nutmeg. Set aside. In the bowl of a stand mixer, beat butter, granulated sugar and brown sugar on medium-high using the paddle attachment. Beat until pale and fluffy, about 4 minutes. With the mixer on low, add eggs one at a time. Mix well after each egg. Scrape down bowl as needed. Add vanilla extract. Mix to combine. In a separate measuring cup, combine milk and vegetable oil. Add the flour mixture in three batches, alternating with the milk/oil mixture, beginning and ending with the flour mixture. Do not over mix. Stop the mixer and scrape down the bowl. Add Holiday Nog, cinnamon, nutmeg and vanilla. Continue mixing on low to med-low until silky and smooth, about 3 to 5 minutes. 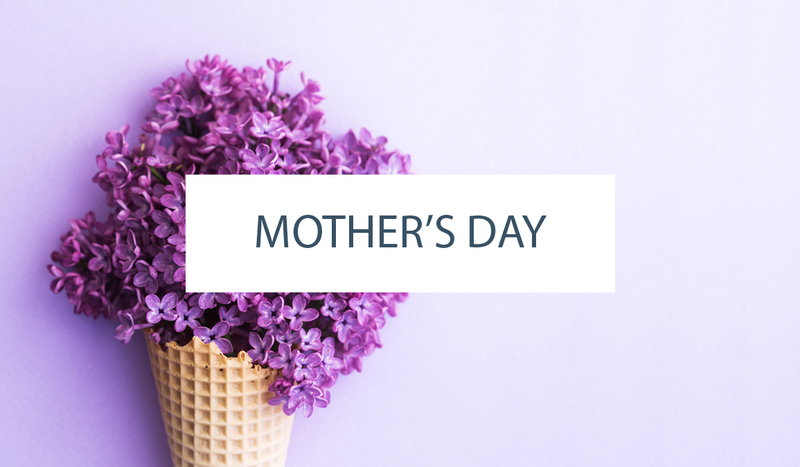 Place one layer of cake onto serving plate or cake stand and top with about one cup of frosting. 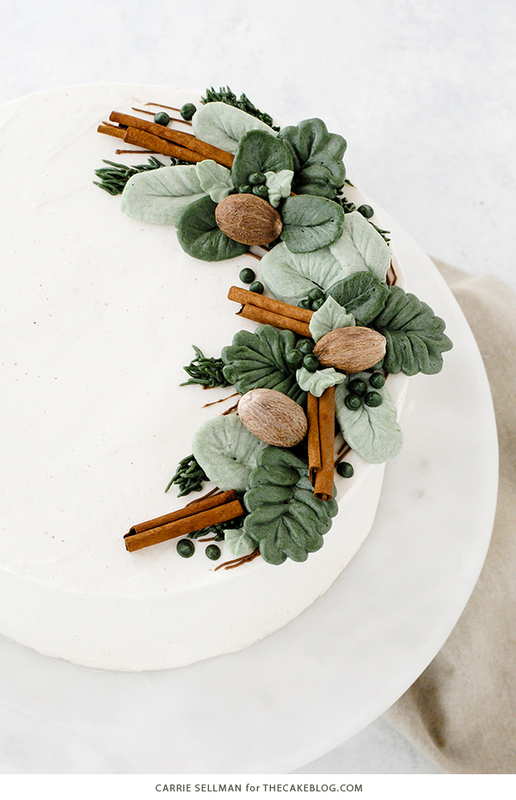 Decorate with piped buttercream leaves, broken cinnamon sticks and whole nutmeg, if desired. I made two batches of frosting for the cake, as pictured. One batch is plenty to fill and frost the cake itself. The second batch was made, minus the Holiday Nog Milk, cinnamon and nutmeg, to pipe the buttercream flowers. You will have more than you need to for piping, but plenty for practicing. Remove whole nutmeg and cinnamon sticks when serving, or advise guests not to eat them! This should go without saying, but no one wants an emergency dentist appointment during the busy holiday season. This is a sponsored post written by me on behalf of Promised Land Dairy. Thank you for supporting the sponsors who keep us going! This sound incredible delicious! Since I already love eggnog I will definitely try this. Is this Friday 3/2017 when the video will be available? Yes, the tutorial will be live this Friday, 11/3/2017! Oh, that is great–thanks so much. I saw on the pumpkin spice you asked if we wanted a tutorial and I guess others thought so too. 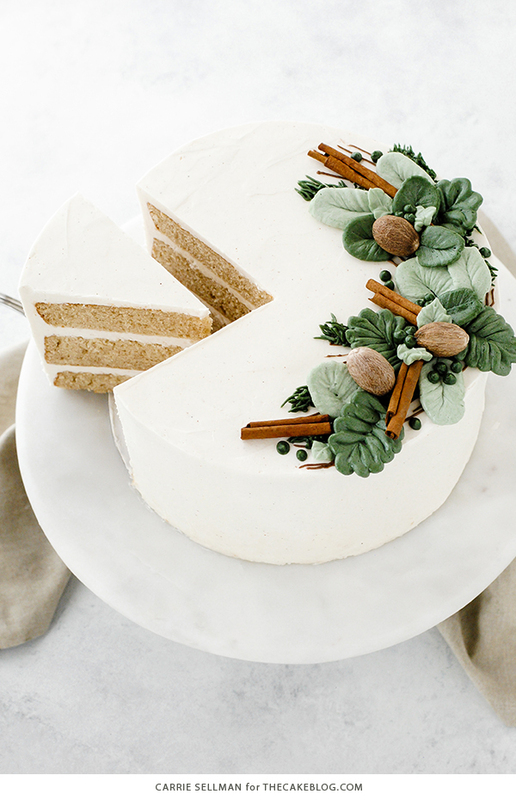 Love how this looks and I’d be happy to try the eggnog cake. I can’t wait to make this, it sounds delicious!! I’ve made your apple pie cake before and it is just fantastic!! I’m making it for someone for Thanksgiving this year. YUMM! 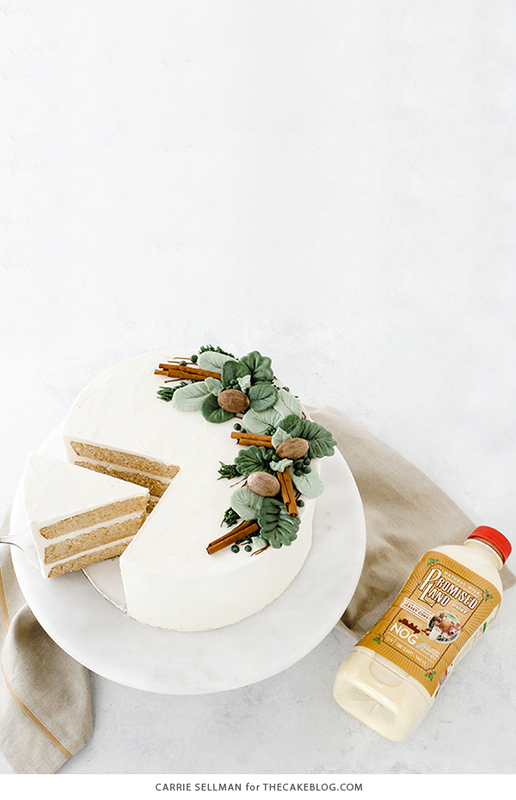 Not only is this cake delicious, but Promised Land makes the best Egg Nog. If you haven’t tried, do. And while you are there grab some of their Chocolate Milk. haha! It’s life-changing. I completely agree Amber! SOOOO good! Honestly, I have not tried this recipe with any alternative milks – but you’d also have to swap out all of the butter in both the cake and frosting to make this dairy free. 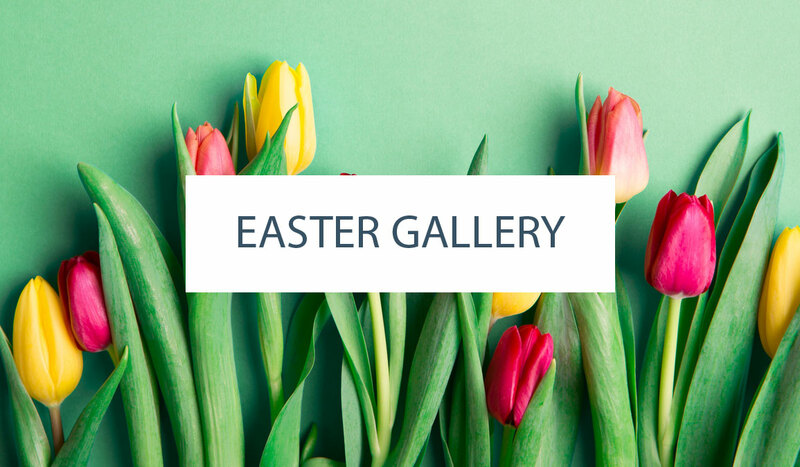 If you give it a go, let us know how it turns out! If I don’t have promise land eggnog where I live, can I substitute with any other eggnog? I assume another eggnog would work just fine, but whole milk is also a good substitute — just increase the ground spices just a tad to make up for the difference. Do you think this would work as a bundt cake or would I have to adjust the measurements to fit the pan? I’m trying to find a way to make an egg nog rum cake, but I’m a fairly novice baker who needs a good starting point before I start putting my own spin on things. Any suggestions will be appreciated, I’ll even give you a shout out on my site. 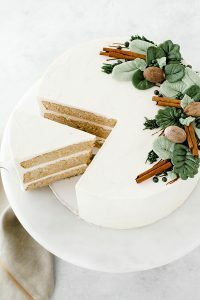 I made the eggnog cake as directed this past Christmas, but came back to this recipe for the Swiss Meringue Buttercream! It’s the best recipe and instructions I’ve found! Swapped the eggnog/spices/vanilla for 2 tsp coconut extract for my grandmother’s coconut cake with pineapple curd filling and it was INCREDIBLE! Thank you! Loved the recipe. And the cake is looking fabulous. Thanks for this wonderful recipe. Made this for Christmas and it was a very moist and tasty cake, but I found that it had a really tender structure that left crumbs all over the serving plate when cutting. Plenty of raves from family and friends and absolutely no complaints, but the perfectionist in me wants to do better next time. I’m thinking that slightly less sugar and more eggs (maybe 1.75 cups sugar and 4 eggs?) would make for a better textured cake, and hopefully the oil would still help keep it moist? The Swiss meringue buttercream was fantastic – I’ve made Italian before, but it was a lot easier and it was incredibly durable, even if it did scare me a few times by looking curdled after adding the butter. I barely had enough to frost the three layers and ended up with a really simple design (upside down powdered sugared rosemary trees), so definitely make that second batch if you want to do frosting decorations!